The Writing Bug: Book Review: Power of 100! Book Review: Power of 100! I recently received a copy of, *The Power of 100! 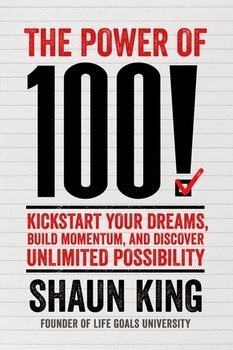 Kickstart Your Dreams, Build Momentum, and Discover Unlimited Possibility by Shaun King and the timing was perfect. I always try to start the year exploring my long term and short term goals. I reflect back on the previous year to see how I fared and determine where I am headed in the New Year. The Power of 100! provides a fresh new take on many concepts I have read about and studied over the past decade related to living the life of your dreams. I believe this is so true. It is like expecting your GPS to give you good directions without programming in your final destination. We all agree, that would be ridiculous. Yet, we do this with our lives. I meet many people who dream of being writers, but when I ask more questions about what type of books or articles they want to write or what they eventually hope to accomplish with their writing, they can’t answer. If you don’t know where you’re going, then how are you going to figure out how to get there? The first part of the book explains why it is important to set goals, some common fears and how to face them and some helpful tools in time management. It then moves into the seven areas and talks about creating your YORG’s in each one. A YORG is “Your Outrageously Ridiculous Goals.” Eventually you will come up with 100 (hence the name of the book). Now before you roll your eyes and think that sounds impossible, you can be reassured that once you read the book you will feel equipped and even excited to make your list of 100. King gives you everything you need to make this happen before sending you on your way to becoming the extremely successful, high-performing version of yourself. Overall, this is an amazing book I highly recommend to anyone needing direction in their life or anyone needing a refresher course on the importance of setting life goals. Throughout the book, I was a little surprised at the occasional use of “dude” (I am clearly getting old), but this, by no means, lessened my view of King’s knowledge in this field and his talent as a writer. I look forward to setting some time aside over the next couple of weeks and coming up with my list of 100 YORG’s and I will be sure to share them with you. I want you come up with one YORG for your writing life and share it in the comment box by January 21st. I will randomly choose one winner and that person will win a copy of the The Power of 100! (graciously donated by the publisher). The book obviously goes into more detail, but here is the basic criteria for creating your YORG. I can't wait to see your YORGs! *I received a free copy of this book from Howard Books, for my honest review. The opinions expressed here are my own. Finish the last 725 miles of the 800 mile Arizona Trail (Mexico to Utah), write a book that's better than Cheryl Strayed's "Wild", and have it published or self-published by the end of 2016. Survive the teenage years of my four daughters, to be completed sometime in the 2020s. Visit both American Disney parks in one year. Make Wooden Pants Publishing a top ten company by the end of 2015. Regrow the hair on the top of my head. Except for Rich's hair regrowth, these all sound very possible guys. Maybe so, Kerrie, but given my health, it will be the biggest stretch of my life. Jerry, I believe in you...I know you can do it! The only thing I should commit to is cheerleading for Dean, Jerry, and Rich!!! Although....I could make an outrageously ridiculous goal to complete two novels in 2015.... Okay, that's the one. Jerry, that will make it even better when you reach that goal. I'm rooting for you! Pat, I've seen how many words you can crank out in a weekend at the retreat. 2 novels in 2015? Absolutely possible. Write and polish one or more pages a day until my work is complete. This probably sounds like small potatoes, but I need to work on consistency and I do work rather slowly. Anyway, I read once that's how Harper Lee finished To Kill a Mocking Bird so obviously it can work! Sarah, I know polishing our work can be a huge deal. Can you give yourself an actual deadline to have it done? Maybe Sept. 30, 2015? Good point Kerrie!! I think that is an excellent idea! Between the YORG's that were emailed to me and the ones here in the comments, a winner was randomly selected. Congratulations to: Dean Miller. He will win a copy of the Power of 100!